Thanks to Franz Elsener (photo left), who sends a reminder of the workshop with Tom Nechville which is scheduled to be held at the Musikhaus Saitensprung in Switzerland on 20 August at 3.00-5.00 p.m. The Toy Hearts (UK) are delighted to announce that a date has been added to their support shows for the Quebe Sisters Band (USA), on tour in the UK this month. In addition to the shows in Leicester and Bedford, the band will now be supporting the award-winning Texas Western Swing phenomenon at their London show on 3 August. Wed. 28 July The Musician, Clyde St, Leicester LE1 2DE; £7, doors 8.00 p.m.
Thurs. 29 July Bedford Corn Exchange, St Paul's Square, Bedford MK40 1SL; £12, doors 8.15 p.m.
Tues. 3 Aug. The Luminaire, 311 Kilburn High Road, London NW6 7JR; £10, doors 7.30 p.m. The full UK tour schedule for the Quebe Sisters Band can be seen on the Bristol Music Foundation website. 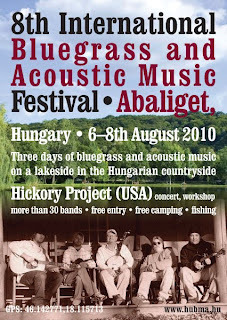 It includes two dates with the Carrivick Sisters (UK), on 4 and 5 Aug.
As promised in the European Bluegrass Blog on 8 July, the full programme for the 8th International Bluegrass and Acoustic Music Festival (6-8 Aug. 2010) at Abaliget, Hungary, can now be seen here. Hickory Project (USA), the headliners, will be performing on the Saturday and Sunday concerts, along with over thirty other acts during the total of three days. Free admission, free camping, workshops, and fishing are also part of what the Festival has to offer during its three days of bluegrass and acoustic music on a lakeside in the Hungarian countryside. There are some things of simple pleasure in life you don't want to miss. La Roche Bluegrass Festival 2010 surely is one of them. With 150 volunteers, the festival is ready to offer all you expect: bluegrass & acoustic music, a little break with good homemade food, meeting friends, a little walk, some shopping, children entertainment: La Roche Bluegrass Festival has it all at the same time!!!! 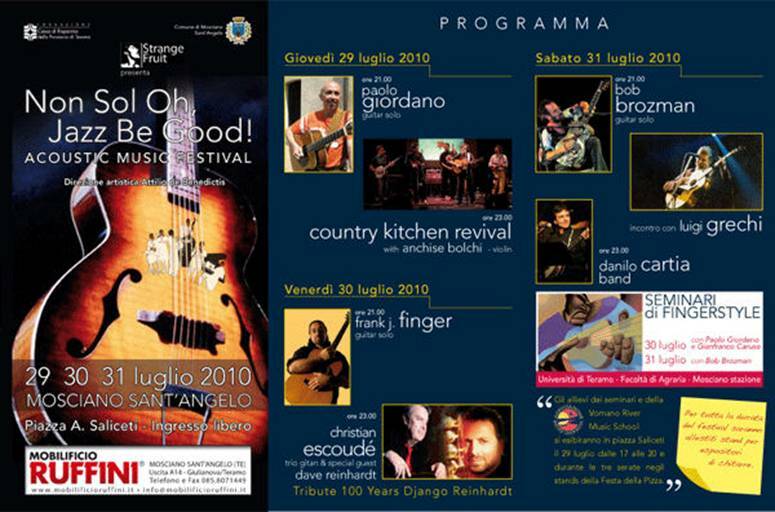 The musical programme with 40 free CONCERTS, 31 bands from USA and Europe. The fringe of the festival starts Wednesday 28th July 7 - 10 pm with bluegrass bands playing in front of restaurants and cafés in the centre of town and at the station. Don't miss our friends Mideando String Quintet from Italy (Thu), DALE ANN BRADLEY & THE BLUEBILLIES (USA) and Redwine (I) on Friday, HICKORY PROJECT (USA) and KRENI (CZ) on Saturday, and REDDOG (USA) and many more on Sunday! Festival ends Sunday 1st August 11 pm! 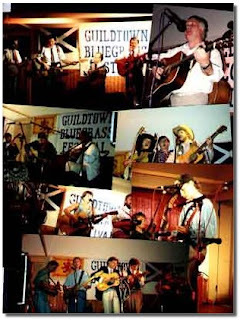 Thanks to John Wirtz for the latest press release on this year's Didmarton Bluegrass Festival (2-5 Sept. 2010) at Kemble Airfield, near Cirencester, Gloucestershire, England - seen by many as Britain's premier bluegrass and acoustic music festival. The full press release can be read here. For images or more information about the press release contact Joanna Froud by telephone (07500 959630) or e-mail. This year Didmarton offers its biggest and best programme, headed by two multi-award-winning groups: Peter Rowan (USA) with his full Bluegrass Band, and the Claire Lynch Band (USA). The thirty-five acts confirmed at present, featured in nine scheduled concerts, also include a wide range of acoustic music headed by folk superstars Show of Hands on a special Thursday-night concert. All the usual Didmarton attractions include concerts, dance displays, instrumental seminars, the tuition tent, a wide range of traders and quality catering, and open mic sessions. 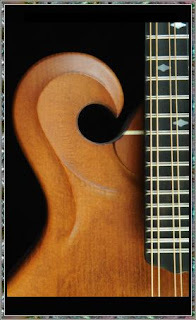 The 2010 Didmarton raffle features instruments donated by two highly respected luthiers, Tom Nechville (USA) and Phil Davidson (UK). All proceeds go to helping young musicians to attend Sore Fingers Week. All site facilities will be open from Wednesday afternoon till Monday morning. The bar, with the best beer prices on the UK festival circuit, will be open from Thursday through to Sunday night. Tickets are now on sale on the Festival website. An advance booking discount is on offer. 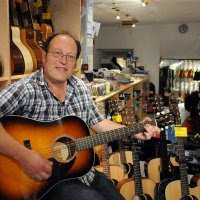 Oliver Waitze of the New Acoustic Gallery in Solingen, Germany, sends the NAG's July 2010 (holiday issue) newsletter. The NAG will be closed from 30 July to 9 August; from 21 to 30 August; and on Saturdays during August. The leading news item is the concert by Mike Marshall and Caterina Lichtenberg (photo above), who will play duets for mandolin and mandocello at the NAG, starting at 8.00 p.m. on 11 September 2010; VV €25/AK €30. Tickets can be booked at +49 0212/2474007 or by e-mail. Early booking is strongly recommended. The new CD by the duo is now in stock at the NAG for €19.90. The Mediterranean Music School will be held from 31 July to 7 August in Tuscany, Italy, for players of all levels. Full details are on the School's website. New instruments in stock at the NAG include the Weber Gallatin F model mandolin (right, in Faded Leather finish), Weber Aspen mandolin, Weber Alder #1 mandola (used, like new, €990 with Weber case), Weber Bridger A-style mandolin (used, like new, €1990 with case), Holzkoffer fiddle (€199), LeGrand Gypsy guitar LG01 (€649), and a rosewood D-28 Tony Rice model. Also in stock are Sennheiser MD 441 N microphones (€549) for acoustic instruments. A great opportunity for upright bass players - the exemplary Barry Bales (bassist with Alison Krauss & Union Station) has just released a 140-minute DVD, A solid foundation to acoustic bass, on Acutab Publications. But that's not all the good news; some astounding prizes, worth up to over $1,000 for the grand prize winner, can also be won in an associated competition which looks like a good deal of fun. Find all the details here or on the original Bluegrass Blog. 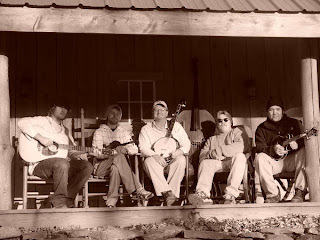 Doc Watson will head a distinguished lineup at the 5th Mountain Song Festival on 10-11 September 2010 at Brevard, North Carolina, which will be hosted by the Steep Canyon Rangers. Other acts on the programme include Red Wine from Italy and the Kruger Brothers (CH/US). Tickets are now on sale for the Mountain Song Festival, which is an annual benefit for the Boys & Girls Club of Transylvania County, North Carolina, and is held at the beautiful Brevard Music Center, 349 Andante Lane, Brevard, NC 28712. 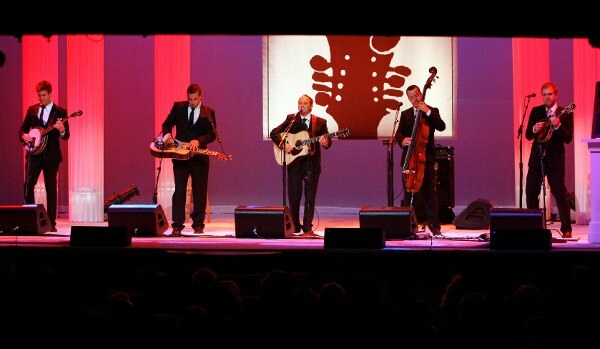 We are preparing the fine details of our trip to Guildtown's bluegrass festival in Scotland. This time we will travel by car, taking off a bit earlier, on Wednesday morning, so we might be in the UK or Holland in the same evening, 28 July. We are curious which way is more interesting (both from the tourist and musician's point of view), if through Manchester or closer to the eastern seashore (passing through Scarborough). Also, would you know of any club/pub/place they might want to hear us on Wednesday or Thursday night, which would not be far from our route? Our route allows us to perform even in the southern Netherlands or Belgium for Wednesday evening. If you have any suggestions, contact Peter by e-mail. 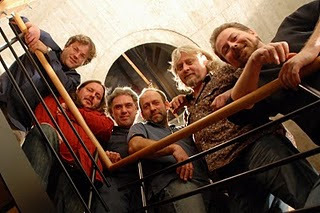 Headwater, the 'rock 'n roll stringband' from the Vancouver area of western Canada, will be touring in Switzerland, Germany, Austria, and the Netherlands in September and October 2010. 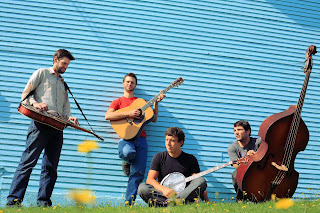 Headwater consists of Jonas Shandel (lead vocals, guitar, banjo), Matt Bryant (lead vocals, guitar, mandolin), Pat Metzger (upright bass, vocals), and Tim Tweedale (steel guitars). The band is also on MySpace. Dates listed on Headwater's tour schedule are as follows. Sat. 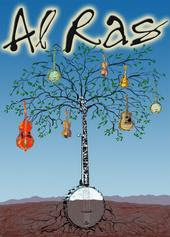 4 Sept. Allrad & Music Festival, Wohlen, Switzerland; 5.00 p.m. Sat. 11 Sept. Marburg, Germany; 8.00 p.m. Sat. 18 Sept. Lilienfeld, Austria; 7.30 p.m.
Fri. 24 Sept. Fluc *EARLY SHOW*, Praterstern 5, 1020 Vienna (Wien), Austria; 9.00 p.m.
Mon. 27 Sept. Weekender Club, Tschamlerstraße 3, 6020 Innsbruck, Austria; 9.30 p.m.
Thurs. 30 Sept. Music Star, Kiebitzreihe 25-27, 22844 Norderstedt, Germany; 8.00 p.m. Sat. 2 Oct. Kesselhaus LAGER, Industriestraße 4, 02692 Obergurig, Germany; 9.00 p.m.
Mon. 4 Oct. Meneer Frits, Jan van Lieshoutstraat 3, 5611 Eindhoven, the Netherlands; 8.00 p.m.
Wed. 6 Oct. QBus, Uiterstegracht 142, Leiden, the Netherlands; 8.00 p.m.
Thurs. 7 Oct. Het Huis Verloren, Kerkstraat 10b, 1621 CW Hoorn, the Netherlands; 8.00 p.m.
Fri. 8 Oct. 't Keerpunt, Oostermoer 1, 9656 PE Spijkerboor, the Netherlands; 8.00 p.m. Sat. 9 Oct. 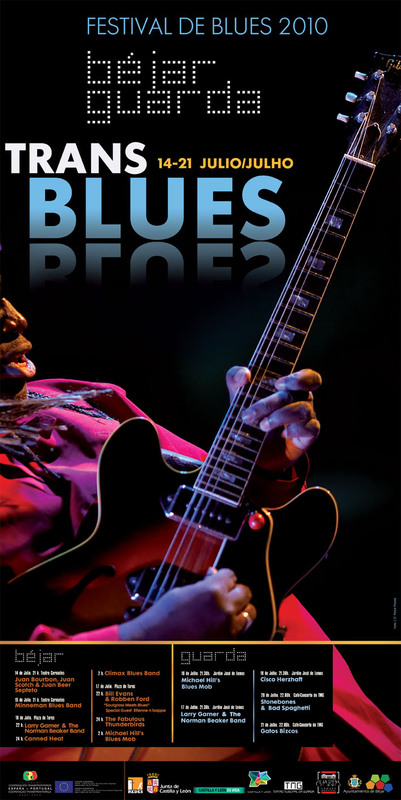 The Nix BBBlues Club, Enschede, the Netherlands; 8.00 p.m.
Sun. 10 Oct. Roepaen Festival, Kleefseweg 9, 6595 NK Ottersum, the Netherlands; 7.00 p.m.
We are six weeks into our four-month-long US tour and we are for sure having the time of our lives... Wherever we go we meet fantastic people and get to see the nicest places and this tour is certainly over all our expectations. We just found out that we're nominated for Emerging Artist of the Year and we are so thrilled about that... please keep us in mind when you're voting! G2 are booked in the USA by Roe Entertainment. Keep up with the band on Twitter, Facebook, and MySpace. The Crossroads Entertainment & Marketing agency of Arden, North Carolina, has just signed the Northern Ireland gospel trio Revelation (left) to its record label, Pinnacle Records. This is the first time in decades that any major Southern Gospel record company has signed a group from outside North America. The group was founded in the last five years, after David Strange and Thomas McCalmont met Andrew Calderwood. Jeff Collins of the agency says: 'It is with much excitement that Crossroads has the opportunity to present Revelation to the US market.' Revelation begin work on their first Crossroads project on 2 August 2010 at the Crossroads Studios in Arden, NC. Tony Trischka will be playing on 5 November in Barcelona and doing a workshop at Al Ras on 6 November. Barcelona Bluegrass Band is recording a new CD and has a new website. Check out my new site - has some tab! 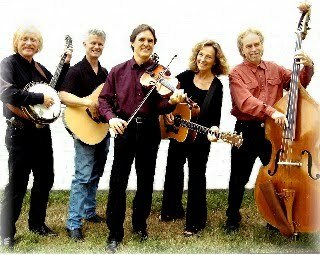 The Scottish Bluegrass Association announces that Craig Duncan & Friends (USA) will headline the 24th Annual Guildtown Bluegrass Music Festival, held on 30 July—2 August 2010 at Guildtown, near Perth, Scotland. Also in the lineup are Peter Ruby's All Bells & Whistles (CZ) and six Scots bands. Full details, including booking methods and link for downloading the programme, are given in the SBA's latest issue (#9; July-August 2010) of the e-magazine Bluegrass & More. Craig Duncan & Friends can also be heard together with 'Magic of the Harp' in a special concert on 3 August at Merchiston Castle School, Scotland, in aid of Alzheimer Scotland. Huge success for two European Bluegrass bands: In „Emerging Artist Of The Year“ category in round two (of three to nominations) the IBMA Awards 2010 two well known European bands are listed: „G2 Bluegrass Band“ and „The Toy Hearts“. Lets hope (and vote) that these bands will make it into round 3 as well. We'll keep our fingers crossed, for sure! The „Krüger Brothers“ are also listed, once in the category of „Instrumental Group Of The Year“, and Jens Krüger is amongst the „Instrumental Performers Of The Year“. 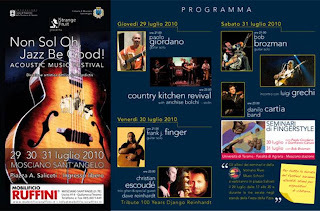 The Danilo Cartia Band (Danilo Cartia, lead vocals, 5-string banjo, guitar; Andrea Moneta, vocals, Chapman stick, upright bass; Luca Dominici, vocals, electric/acoustic guitar; and Max Giua, percussion) will be playing at 11.00 p.m. on 31 July 2010 at Mosciano Sant’Angelo (TE), Italy, as part of the Oh Jazz Be Good! Festival. Their fellow Italian bluegrassers of Country Kitchen Revival are also taking part in the festival two nights earlier (29 July). Along with two major bluegrass festivals - Banjo Jamboree in Čáslav and Jamboree in Strakonice - there are bluegrass festivals every weekend all summer; sometimes even more than one at a weekend. Some of them are big, some of them modest, somewhere bluegrass music is mixed with singer-songwriters or acoustic music, but still a lot of chances for the bands to play. Thanks to David Nemecek's agency there was a short tour of bass-player Victor Krauss (Alison's brother) with his band. Not bluegrass at all, but interesting blend of acoustic music of all kinds, enjoyed by the audience especially in club-like venues. The legendary Czech band Druha Trava returns to America in late September for a five-week tour that begins in Texas and goes on to New Mexico, California, Idaho, Colorado, Kansas, Nebraska, Minnesota, and Iowa, before ending in Chicago on 30 October. 15th Petr Brandejs Band workshop is going to take place on 15-17 October in Male Svatonovice, Czech Republic. For more info, e-mail. After the short July/early August vacation period for families with kids in school, the bluegrass festival season will continue in Switzerland. The festivals in various regions are hoping the good weather of last year will be repeated. Noteworthy is that the Sunny Mountain Grass Bluegrass Festival in Loomis (eastern Switzerland) always feature an instrument. The bands are cleverly selected to underline the theme. 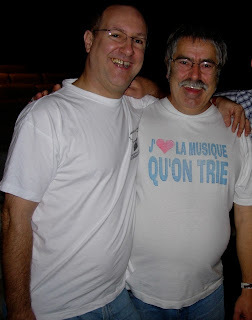 Bluegrass Stuff (I) with Massimo Gatti and Blue Side of Town (D), who never let a banjo near them, are two examples. Most of the festival-like events have been going for years, but one interesting second-year event is the Western Night, Jam Session in Erstfeld. They plan to have a lot of bluegrass this year, and an afternoon/evening festival on the road to the St Gotthard Pass could be very interesting, especially in combination with other stops. The Italian part of Switzerland, Ticino, is the place to be in the autumn. The Swiss Bluegrass Music Association Fan Fest this year will be on 13 November in Brugg. We expect to have another great time with an evening of open mic groups playing a few tunes each, and two showcase bands. We would love to have people from other places come by and pick their favorites for us. Everyone is welcome! 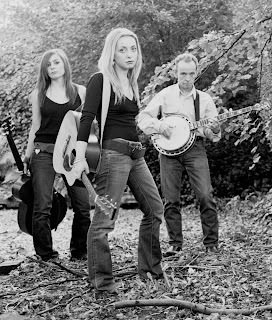 The Bluegrass Jamboree is also called 'Bluegrass and Americana Music Festival' this year. The stop in Switzerland will be in Schaffhausen on 17 December. It will be interesting to see how they do that close to the holidays and at a new venue that is still kind of off to one side, but Michael Cleveland & Flamekeeper should be a must-see and Jeff & Vida and Shotgun Party might attract 'festival people' that don't really like one-band concerts and people that don't like only straight bluegrass. For the rest of us, it's all good! 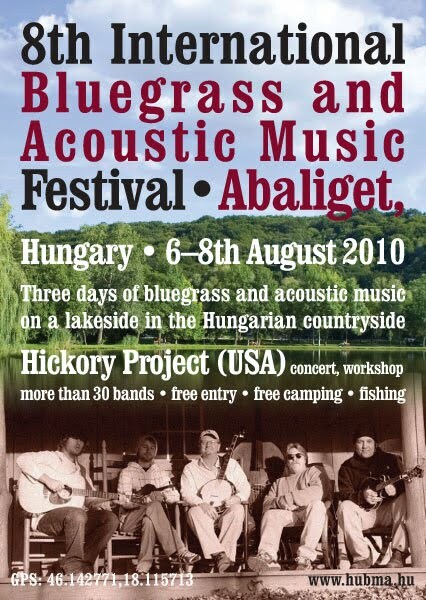 We're happy to announce that in the life of the International Bluegrass and Acoustic Music Festival at Abaliget, Hungary we got the second chance to have a band from the USA as the main event. This year, after some enthusiastic organizing work Hickory Project will appear at the festival, increasing this year's festival's number of concerts to 36. The programme is being organized at the moment; for complete programme info please visit the homepage of the Hungarian Bluegrass Music Association in the near future. A new feature for this year is the online video broadcast of the live performances through the internet. 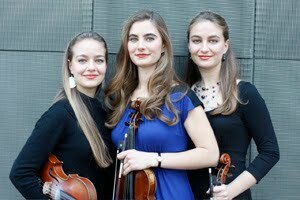 You'll be able to follow the programme through the homepage of the Hungarian Bluegrass Music Association during the festival. The final programme and the direct link for the video broadcast will be anounced here on the European Bluegrass Blog. 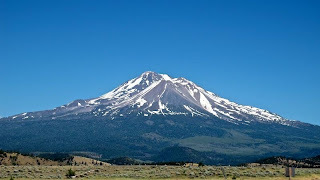 EBMA News 7/7/2010: Check out EBMA's new service - Send a Bluegrass Greeting from wherever you are to any destination. Check out EBMA's Online Shop for more! The postcards with EWOB artwork by Liz Meesters-Janssen, as mentioned in the EBB on 31 May, are available as greetings cards. Buy a full set or the design of your choice! The following jams or workshops are being arranged, so please let me know if you are interested in attending one of them and I will give you more details later. Aug. 20 Musikhaus Saitensprung, Schaffhaussen, Switzerland; 3.00-5.00 p.m.
Later I'll be visiting Italy and England, Oslo, and Sweden. Thanks to Laurent Eckhout, who announces that the programme for this year's Picnic Festival at Namur, Belgium, is booked and can be checked on the Festival website. The Sixth Picnic Festival extends over three days to Sunday 5 September 2010 - in the unique setting of the Terra Nova section of the Citadel at Namur. It opens on Friday 3 September at 8.00 p.m. with a dance to music by Cave Canem (B) and Les Chauffeurs à Pieds (Quebec), with dancing instruction for beginners. On Saturday (traditionally the 'bluegrass day' of the Festival), bands taking part include Rocks & Ivy (B), G-Runs ‘n Roses (CZ/SK), the duo of Tommy Gauthier and Antoine Dufour (Quebec), the Toy Hearts (UK), and 4 Wheel Drive (NL/D/B) featuring Jolanda Peters. There's an equally strong lineup on Sunday 5 September for the Celtic and acoustic music part of the Festival, with events beginning at noon. Tommy Gauthier & Antoine Dufour, Robby Lynch, and Chapeaux Bas will be playing throughout the weekend on the Irish Pub stage; 'L’Ecole des Chèvres à Pull' (B) provides a spectacle for children on Sunday; and there will be an open stage for jams. Full details are on the Picnic Festival website, and the Festival also has a Group on FaceBook. 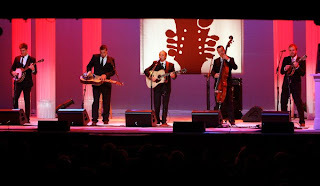 British Bluegrass News #53 (summer 2010) has been posted out to members of the British Bluegrass Music Association (BBMA). It retains the new 'big' size at 48 pages, packed with solid content, including an interviews by K.L. Browne with Claire Lynch (USA), by Pat Francis with dobroist Jimmy Heffernan (USA), by Aaron Hawkes with Frank Ray of Cedar Hill (USA), and by Richard F Thompson with Phil Rosenthal. The issue also includes features on the scene in south-east England, the Peter Rowan Bluegrass Band, the late Janet Holland, and 'Learning to play the banjo'. Kevin Garratt of the Yorkshire scene reveals his ‘Favourites’, and 'The story behind the song' looks at ‘Echo Mountain’, as recorded by Cedar Hill. All this plus the regular 'What’s on', tour details, CD and book reviews, 'Light in the window', 'SmallTalk', six area reports, and more. This issue is the fifth to appear with Richard F Thompson as editor-in-chief. British Bluegrass News is published by the BBMA, which was founded in 1990 and will be celebrating its twentieth birthday this year. To join the BBMA, contact the Membership Team, Clare and David Rozzell, by e-mail. You can also join online through the BBMA website. For further information about the BBMA and the BBN e-newsletter, contact Richard F. Thompson, Press Relations, 14 Lime Grove, Lichfield, Staffordshire, England, WS13 6ER; 'phone +44 (0)1543 252683; e-mail. Thanks to Katrin Bobek for news of the Moonband (D), an 'alternative folk' band from Munich, Bavaria, who use 5-string banjo, mandolin, acoustic guitar, and upright bass as well as percussion and other instruments. 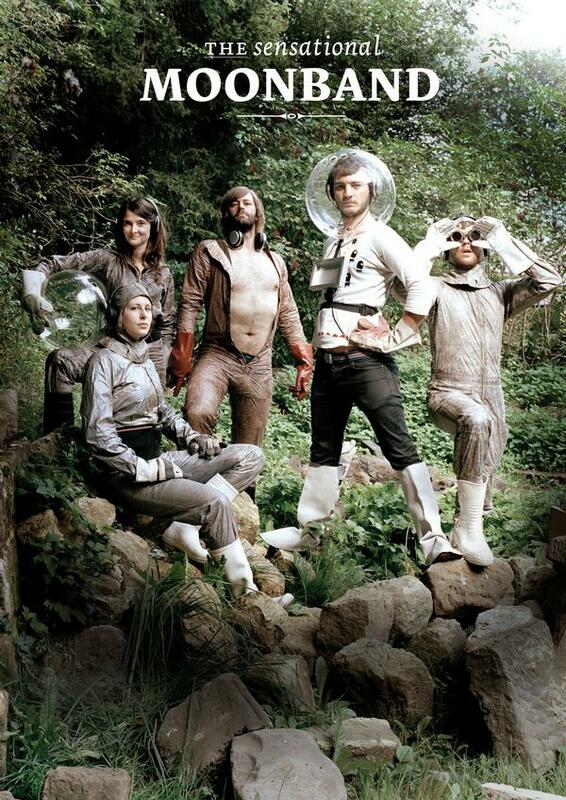 Their album Songs we like to listen to while traveling through open space will be officially released on 13 August 2010, and they now have promotion in the UK as well. 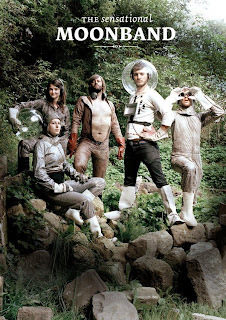 The Moonband consists of Eugen Mondbasis (vocals, guitar, banjo, bouzouki, harp), Chris Houston (vocals, guitar, slide, percussion), Katrin Bobek (vocals, mandolin, ukulele, banjo, glockenspiel), Andy Henningsen (upright bass), and Elena Tschaffon (percussion). Listen to the Moonradio, and find the band on CD Baby, Website, MySpace, Facebook, and LastFm. News from the only bluegrass band in Portugal. Stonebones & Bad Spaghetti will play at the 2nd International Guarda-Bejar Blues Festival - TRANSBLUES - on 20 July in Guarda, Portugal. It will be the only Portuguese band at the festival. Here is the programme. Stonebones & Bad Spaghetti will also play at the biggest festival in Portugal, in the beginning of September, Festa do Avante, but I don't know the exact date yet. I'll tell for sure what date it will be during this or the next month. 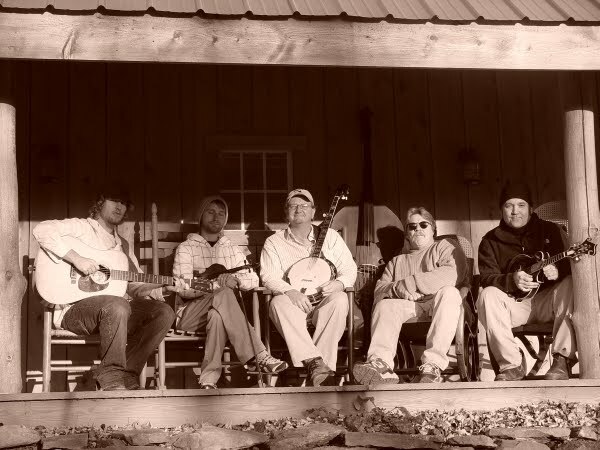 G2 to play on IBMA's Fan Fest! 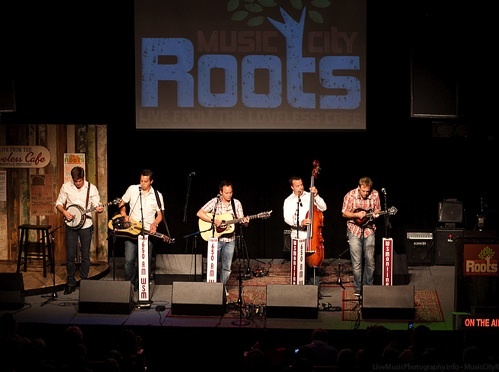 Sweden's G2 Bluegrass Band are among more than sixty distinguished bands taking part in Fan Fest (1-3 October 2010) in Nashville, TN, which rounds off IBMA's World of Bluegrass 2010. More details are given in the IBMA's latest press release, which can be viewed online here. 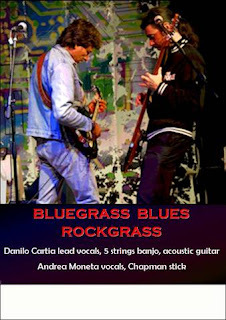 Danilo Cartia (5-string banjo, acoustic guitar, lead vocals) and Andrea Moneta (Chapman stick, vocals) will be playing a 'Bluegrass, Blues, Rockgrass' show every evening from 4 July to 11 July 2010 at the Melting Pot, Alghero, Italy. In January 2010 Bulgarian bluegrass songstress Lilly Drumeva released her new album Lovin’ you, recorded in Sofia and in Prague. The repertoire is a mix of bluegrass, country, swing and Bulgarian folk, recorded in two sessions, featuring Czech band Monogram and Lilly’s band Lilly of the West. The first CD promotion concert was held in Sofia on 22 April 2010 at the Sofia Live Club [above]. 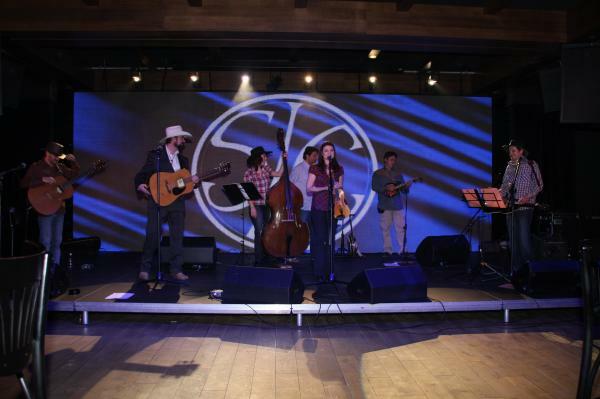 It featured Jasen Vassilev (guitar), Svoboda Bozduganova (upright bass), Misho Shishkov (Dobro, harmonica), with guests Rosen Hristov (banjo, mandolin) and Tsvetan Vlaykov (vocals). The show was opened by Bulgarian radio legend Toma Sprostranov. On 22 June 2010, another CD release party was held in Prague, at the Bulgarian Cultural Center. The concert was organised by Ms Sevdalina Kovarjova-Kostadinova and Mr Volodja Gotsev, managing directors. It featured Czech band Monogram - Jakub Racek (guitar, vocals), Jarda Jahoda (banjo), Zdenek Jahoda (mandolin), Pavel Lzicar (upright bass), with guests Pepa Malina (fiddle) and Svoboda Bozduganova (upright bass). The concert was opened with a short speech by Ms Sevdalina Kovarjova-Kostadinova. Lilly and band performed thirteen songs in the same order as the new album. Show finished on a high with a twin fiddle medley and a lively rendition of 'My window faces the south', with solos of each musician. Fans from the Bulgarian community, Czech bluegrass audience, and others attended. The concert was filmed by Czech cameraman Ales Nemecek and will be available on YouTube. Just before the end, a christening of the new CD took place. Mr Ivan Ivanov, director of Czech music magazine Muzikus, was especially invited for the occasion. He wished Lilly and the new CD lots of success and poured some champagne. After the show guests were treated to a glass of Bulgarian wine, photos were taken outside. On the following night, 23 June, Lilly was a special guest of Monogram at the Vodarny Club in Prague. All in all, two well attended CD promotion concerts, with special guests, featuring all musicians involved in the album. You may obtain a copy of Lovin’ you and get more info on Lilly's website. I just want to slip in a reminder that we have a Bluegrass Show on Internet Radio in Switzerland (see below) and that we would be happy to play your music and promote your concerts, festivals, music, record companies, and bands. Obviously, we need the information and the music. Many Swiss like to go other places to find the music. We can play whatever we get within the old-time, bluegrass genres, if the quality is at least OK. MP3s per e-mail are fine. Regular mail, too (see below). Radio spots that you already have could be integrated into a show. If you send us tickets and promotional CDs to give away on the air or otherwise, we would sure appreciate that. I just thought I would make a few of these reminders over the next few months because I think we could do more with European music but we haven't been getting material regularly (from winning bands at the EWOB festivals, for example), so thanks for putting us on your promotional lists and passing the word on to the rest of your bluegrass communities. Happy 4th of July! Alas, without baseball, but at least the hot dogs are often better in Europe. At the FBMA annual general assembly, Jeff Tronelle was elected to be the new chairman as of 1 October 2010. Jeff plays bass and has been involved in many bands including the long-lasting Cactus Pickers. He also organises the FBMA winter weekend in Vichy every year. The photo shows Jeff (right) with outgoing chairman Christopher Howard-Williams. Christian Labonne (Tennessee Stud) was elected to be vice chairman and he will focus particular attention on giving the website a much-needed facelift. Christophe Constantin and Valerie Morin were relected to their posts of secretary and treasurer, respectively. Over 40 people turned up for the FBMA spring weekend in Brittany, and the annual Grange Rouge meet attracted another thirty musicians, with eight bands performing in the Bluegrass tent. Both of these events are open to non-French and non-members of FBMA. The next big meet will be at Craponne Country Rendezvous in the centre of France (23-25 July; the bluegrass community takes over a large section of the campsite), where the Bluebillies (Bradley, Gulley, Fox), the Quebe Sisters, and the Grascals will play, followed one week later by La Roche Bluegrass Festival, where 31 bands will play from 12 different countries. Headline acts this year are the Bluebillies, the Hickory Project, Red Dog Seattle, Red Wine, and Kreni (last year's contest winners). For more see the La Roche Festival website. We are organising a workshop between Craponne and La Roche, in La Roche, led by Anthony Hannigan and taught by the other members of Hickory Project. We are hoping to make this a long term partnership with THP. There are still places if you wish to attend; see the La Roche website. Henri and Linda te Kaat present a series of bluegrass and country concerts in the Victoriaklef Openlucht-theater on the site of the war museum in Overloon. It is a beautiful open-air setting, perfect for this kind of music. The remaining two shows will be on Saturdays: 31 July and 21 August 21. A series of very nice pictures taken by Alle Hamstra at the recent Big Bear Festival in Zuidlaren can be found here. On 20-22 August, Paul van Vlodrop, Peter Broekhuijsen, Bruno van Hoek, and Elly Beurskens will have the third edition of the bluegrass weekend 'Ins Blaue Hinein' in the German Eifel mountains. These four musicians will do hands-on workshops, individual lessons, plus a lot of jamming. All bluegrass instruments are covered, as well as the singing part. Contact Paul van Vlodrop (e-mail) or Elly Beurskens (e-mail). Those of you who were at Voorthuizen will have noticed the biggest personnel change in Rawhide (above) since 1991. Dimi on bass and Jeff on mandolin join forces with Bert, Dirk, Dickie and Thierry to ensure the continuity of the special blend of bluegrass Rawhide has been renowned for. The new guys fit the picture in all senses of the word. The audience at the wonderful Coastline bluegrass festival in North Wales (held on 4-6 June) can testify. Dimi decided at age of 6 to become a singer. He received his first guitar at 10, and after a few boring years at music school and violent electric noises in obscure underground places, the bass seemed to be his instrument of predilection. As a bassist / singer he evolved from metal to rock to pop to folk to country and at last - his favourite style - bluegrass! The 'metal of country', as he calls it. Dimi is also playing with Kandoris. Jeff, born in Winnipeg, Canada, has been a member of various musical groups in a broad range of styles from classical to jazz and fusion and has played solo mandolin with the Toronto Mandolin Orchestra. Bluegrass slowly came into his life through Irish and then old time music. He taught himself mandolin after completing his studies in classical guitar at the Toronto University The love for his wife brought him to Europe, and the love for bluegrass to Rawhide!!! The Sons of Navarone surprised the magnificent Bühl festval with their strong harmony vocals and comedy show. The reviews in the local newspapers were full of praise for this first appearance of the Sons on German soil. Thanks to the record sale of 77 CDs at Bühl, the first print of 1000 copies of the album At last! was sold out in only two years. July 1 The Sons of Navarone in Brasschaat = TONIGHT!!! Details on the Bluegrass in Belgium calendar.